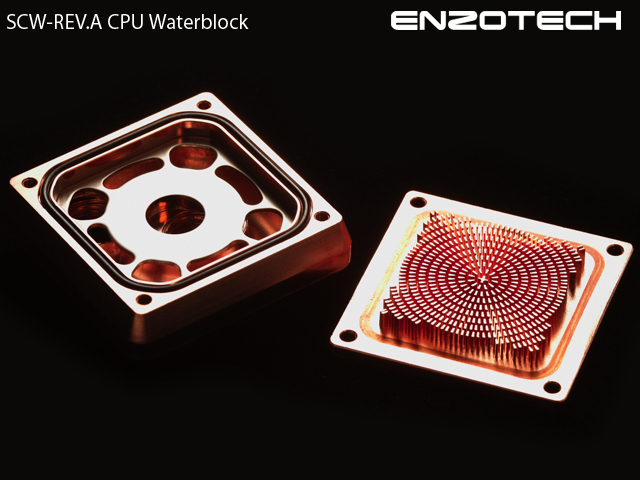 Enzotech Water Blocks can only be used with Enztoech Brand Hose Barb or fittings due to the design of the block tops. We will not cover the warranty if users switch the hose barbs or fittings to another brand. Super high density, radial pattern, micro-pin design (0.5mm from pin to pin), provides maximum surface exposure area for superior cooling performance. Direct injection water flow design, delivers coolant straight to CPU core. Eight return holes pulls heated water away for extremely fast heat dissipation. Metallic Mirror coating gives elegant style and superb finish. Water block's base is flatness machined to .0003 per inch run-out which optimizes surface contact and maximizes thermal conductivity performance. Compatible with all 1/2" coolant tubing.